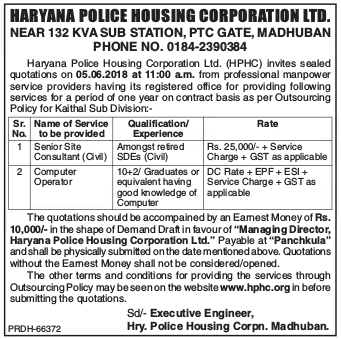 Haryana Police Housing Corporation (HPHC) has given a notification of Senior Site Consultant and Computer Operator Vacancies on the contract basis. The interested candidates can apply for HPHC Recruitment 2018 on or before 05 June 2018. The department has invited sealed quotations from the professional manpower services providers having its registered office. Haryana Police Housing Corporation Recruitment 2018-19 notification is out. As per the Notification, there are Senior Site Consultant and Computer Operator Vacancies. The educational qualification is 10+2/Graduation or Retired SDEs. The age limit is as per the department norms. If you are looking for Jobs in Haryana Police Housing Corporation then this article is going to be very helpful for you. The quotations should be accompanied by and Earnest money of Rs. 10000/- in the shape of Demand Draft in favor of “Managing Director Haryana Police Housing Corporation Ltd.”, payable at “Panchkula” and shall be physically submitted on or before the due date.